A corrido is a popular folk ballad that often reflects on daily life, history or oppression. The authorship of many corridos is unknown as is the case with Corrido de Huaraqui. Verses change from region to region. Dates, towns and names change depending on whom is singing the song and where. One of the small border towns separating Arizona from Sonora share the same name — Naco. As our journey west was to include a stop in Naco we were fortunate to find a CD from a local group of musicians; Los Microbios de Naco — the germs of Naco — and the following corrido. por culpa de la embriaguez. su fin tenia que ser. para que se oiga bonito. This corrido tells the tale of a widow seeking forgiveness for her husband — Sr. Huaraqui — who killed a horse. 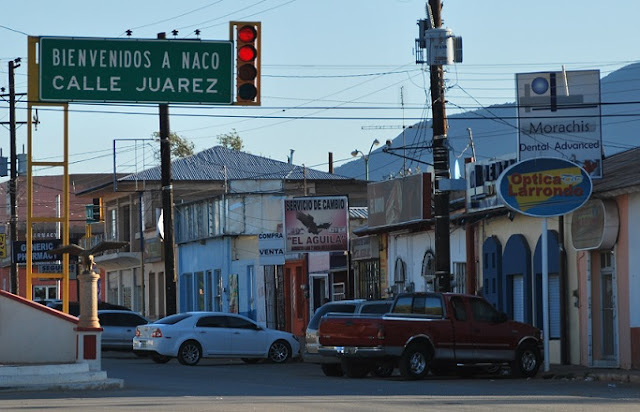 Corrido de Huaraqui takes place about 60 miles south of Naco in Arizpe. A more complete version of the corrido that differs from the one sung by Los Microbios de Naco includes additional verses and the ballad takes place in the fall as opposed to the summer.